Why Should You Visit a Cosmetic Dentist in 2018? When you smile confidently, you feel like a million bucks! Looking in the mirror with a white, bright smile staring back at you is one of the best feelings in the world. If for some reason you don’t feel the greatest about your teeth, you always have the option to make improvements to it—especially when you have an expert cosmetic dentist to help you reach your smile goals. Learn more about what cosmetic dentistry can do for you here! There are many people that will avoid smiling altogether because of missing, chipped, or discolored teeth. Embarrassed of their smile, they may cover their teeth with a hovering hand over their mouth or smile goofily without showing any teeth at all. Life is already challenging enough and there are many things to be self-conscious about—don’t let your smile be one of them. The most important thing to keep in mind is that most aesthetic problems in teeth can be corrected! A great smile conveys high self-esteem and professionalism. Studies have even shown that the general public directly correlates success to a straight, white smile. Smiling with confidence tells people that you’re outgoing, intelligent, and worth getting to know over your counterparts—especially employers. People that have a gorgeous smile are more likely to make friends easily, land jobs, and even get called back for second dates. Sometimes, it can be difficult to feel motivated to take excellent care of your teeth if you don’t necessarily like your smile. 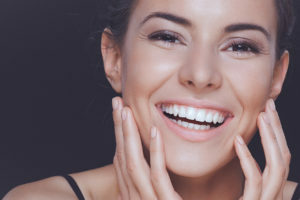 When patients take the initial step of investing in their smile with cosmetic dentistry, they are more likely to take better care of their teeth and gums. After all, once you make that initial step in creating your dream smile, you’ll want to maintain the results for years to come! Patients are even more likely to visit their dentist for regular checkups and cleanings. This way, your dentist can address any concerns and help keep your teeth squeaky clean. Learn More About Which Cosmetic Treatment is Right for You! Cosmetic bonding to repair damaged teeth, alter the alignment of teeth, close gaps between teeth, or cover irreversible stains. Professional teeth whitening treatments or at-home kits for convenient ways to lift surface stains quickly. Your dentist offers an array of cosmetic options for local patients. Call and discover them today! Here at Long Family Dental, we know how much power a great smile holds, and we want each of our patients to experience that memorable feeling. Get the smile you really want with our help. Our office has the tools, resources, experience, and expertise to help you achieve the smile of your dreams. Comments Off on Why Should You Visit a Cosmetic Dentist in 2018?